The following statement describes the overall Policies and practices of Cyprus Car Rentals , including advertising on our network of websites, as well as across other internal sites, and products and services that are offered by the Cyprus Car Rentals. Cyprus Car Rentals delivers advertisements across multiple channels and media, including to web surfers who visit any of the hundreds of web sites that are a part of Cyprus Car Rentals network. With respect to individuals who visit those sites, we collect what is known as 'Click Stream Data.' Click Stream Data is anonymous, and includes information such as a web surfer's IP address, web pages which have been viewed by a web surfer, date and time by a web surfer to an advertisement delivered by us. In addition to the Click Stream Data collected, Cyprus Car Rentals owns numerous web sites and services, and collects information at these sites. At some of the sites owned and operated by Cyprus Car Rentals we ask people to register and provide personally-identifiable data. Examples of personally-identifiable data that may be requested include name, address, and e-mail address. Web surfers who have provided personally identifiable data may elect to have their data deleted from our files, or kept from being used for purposes other than for the service requested, by changing or deleting data from their account or asking Cyprus Car Rentals by email to do this for them. At some sites, including this one, Cyprus Car Rentals collects information on individuals and companies who want to enter into business relationships with Cyprus Car Rentals ('business information'). The non-personally identifiable data that Cyprus Car Rentals collects is used for marketing and sales efforts to better target advertisements and other content to individuals in an effort to create a personally relevant experience for each person. The data is also used to predict responses to advertisements, and to help determine which ads perform best and which content is most appropriate for different individuals. If a consumer elects to provide Cyprus Car Rentals with personally-identifiable data, we may utilize such data for marketing purposes. In addition, that data may be combined with information collected from other sources to assist with targeting ads to that consumer's preferences and behaviors, and for other Cyprus Car Rentals sales and marketing efforts. 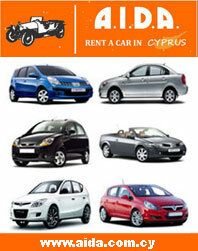 Like many other Web sites, Cyprus Car Rentals makes use of log files. The information inside the log files includes internet protocol ( IP ) addresses, type of browser, Internet Service Provider ( ISP ), date/time stamp, referring/exit pages, and number of clicks to analyze trends, administer the site, track user 's movement around the site, and gather demographic information. IP addresses, and other such information are not linked to any information that is personally identifiable. Google's use of the DART cookie enables it to serve ads to users based on their visit to www.cypruscarrentals.com and other sites on the Internet. All personally-identifiable data provided by individuals is maintained in strict confidence by Cyprus Car Rentals and will be treated with the same level of respect and care that Cyprus Car Rentals treats its other proprietary information and trade secrets. There are instances, however, in which personally-identifiable and non-personally identifiable information is shared with third-parties, as described below. The non-personally identifiable data may be shared with third-party partners of Cyprus Car Rentals on an anonymous basis. With respect to personally-identifiable information, Cyprus Car Rentals may, from time to time, provide information to certain third-party administrative vendors for efficiency purposes in providing administrative services such as billing, delivery and pay-outs, or for other services related to providing a Cyprus Car Rentals product or service. Any third-party vendor so used will be required to enter into a confidentiality and non-disclosure agreement with Cyprus Car Rentals upon terms and conditions consistent with the policies set forth herein. Cyprus Car Rentals may also share personally-identifiable information with third-parties who enter into business relationships with us. These business partners may include financial service providers (including credit bureaus and insurance agents); non-financial companies (including retailers, online and offline advertisers, membership list vendors, direct marketers and publishers); companies that perform marketing services on our behalf, and others such as non-profit organizations. We may also disclose information to a third-party who provides substantially similar services as the original service signed up for, if we decide to stop providing such services ourselves. In such situations, we will provide our subscribers with an opportunity to opt-out of such sharing. Please be aware that Cyprus Car Rentals is very careful about which companies it does business with. In addition to the above, there is also the possibility that Cyprus Car Rentals , or part(s) of the company, may one day be purchased by, or merged with, another company. If that's the case, the acquiring (or merging) company will have access to your information. Finally, Cyprus Car Rentals may share information on individuals as it deems necessary to comply and cooperate with government and law enforcement officials. Cyprus Car Rentals makes every effort to maintain the security of its network and the data we collect. We use state-of-the-art technology, including on some instances encryption, to ensure the highest security standards. Any data that is stored on Cyprus Car Rentals servers is treated as proprietary and confidential and is not available to the public. Nevertheless there are certain services that will give access of data to the public. These include, but are not limited to, Job CV 's. Cyprus Car Rentals has a strict internal security policy with respect to the confidentiality of customer and other data, limiting access only to those employees who have a need to know such information for the purpose of effectively delivering Cyprus Car Rentals products and services. Please keep in mind, however, that the Internet is not a 100% secure medium. Therefore, although we use industry standards to protect information, the possibility of somebody defeating our security measures does exist. Cyprus Car Rentals allows consumers who have voluntarily provided personally-identifiable data, access to their data to ensure that it is correct and to make any changes. Please contact us at info@cyprusnet.com. Cyprus Car Rentals is committed to helping protect consumer privacy on the internet and actively monitors consumer privacy issues. Cyprus Car Rentals in its capacity as an advertising network may link and use information and material from websites found in the World Wide Web without the permission of the website owner. If however website owners do not wish to be advertised or listed in the Cyprus Car Rentals portal they should contact us and we shall immediately remove any links, logos, banners or other information and content relevant to their website. For more information, or if you have questions or concerns regarding Cyprus Car Rentals privacy practices, please send us an e-mail at info@cyprusnet.com.